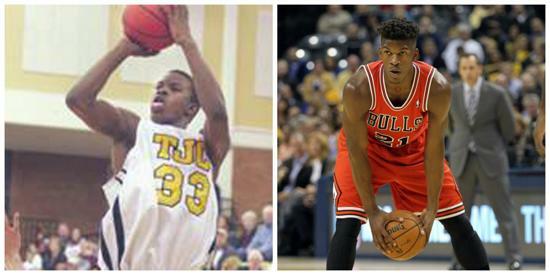 Jimmy Butler has had a long, winding road to NBA success. The former Tyler JC G/SF was selected as a reserve for the Eastern Conference All-Star team. At Tyler (2007-08), Butler averaged 18.1 points, 7.7 rebounds and 3.1 assists per game and was named an Honorable Mention NJCAA D1 All-American. Butler only played one season of junior college before transferring to Marquette, where he played three more years of college basketball. At Marquette, Butler had plenty of success and was named Honorable Mention All Big East as a senior. Butler was drafted in the 2011 NBA Draft by the Chicago Bulls with the 30th overall pick. Since being drafted, Butler has improved drastically ever year and is averaging 20.1 points and 6 rebounds per game this season.